Far from basking in reflected glory, she remains today probably the most dynamic, broadly effective, and controversial First Lady in American history. She was the first First Lady to hold regular press conferences and to routinely travel the nation. 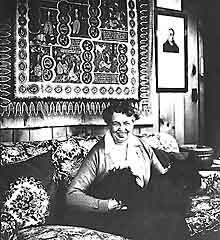 Anna Eleanor Roosevelt (1884-1962) was the niece of President Theodore Roosevelt and the wife of President Franklin D. Roosevelt. Born into a privileged class, she became a successful social activist, party leader, teacher and journalist. By the time she entered the White House, these experiences and the networks she established helped her to transform the role of First Lady. 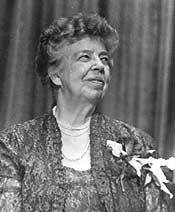 Champion of domestic social reform, economic justice, and human rights, Eleanor believed citizenship demanded participation, saying "We will be the sufferers if we let great wrongs occur without exerting ourselves to correct them." 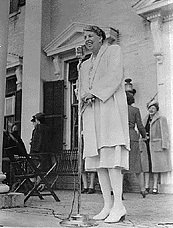 A person of immense energy, Eleanor Roosevelt raised five children, developed a partnership with FDR of unprecedented productivity, and was a prolific writer and public speaker. She represented the administration through economic crisis and world war, and her country, democracy and human rights around the world. Her life after FDR's death was equally productive. At home, she was a civil rights activist ahead of her time. As a member of the first American delegation to the United Nations, she played the essential role in the drafting and adoption of the Universal Declaration of Human Rights. Her commitment to justice often placed her at risk and made her an easy target for zealous critics. In 1961, President John Kennedy appointed her chair of the first Presidential Commission on the Status of Women. Click the slide icon to start a slide show. Close that window to end the slideshow. Click buttons above for more images.